Skills. Rex has finally developed his core SLIGHTLY and can sit up for a half minute or so. He still topples over like a Leaning Tower of Baby, which immensely pleases Landri (him falling over). Rex also excels at rolling around on the floor, and eating of course (and has added the skill of holding his own bottle to his repertoire). His most notable skill however (besides spitting up and drooling), is definitely the art of the blowout diaper. The kid blows out about 95 out of every 100 dirty diapers that he cooks up for me. Like explosive, up the top of the back of the diaper, all over the clothes, carseat, etc kind of blowout diaper. 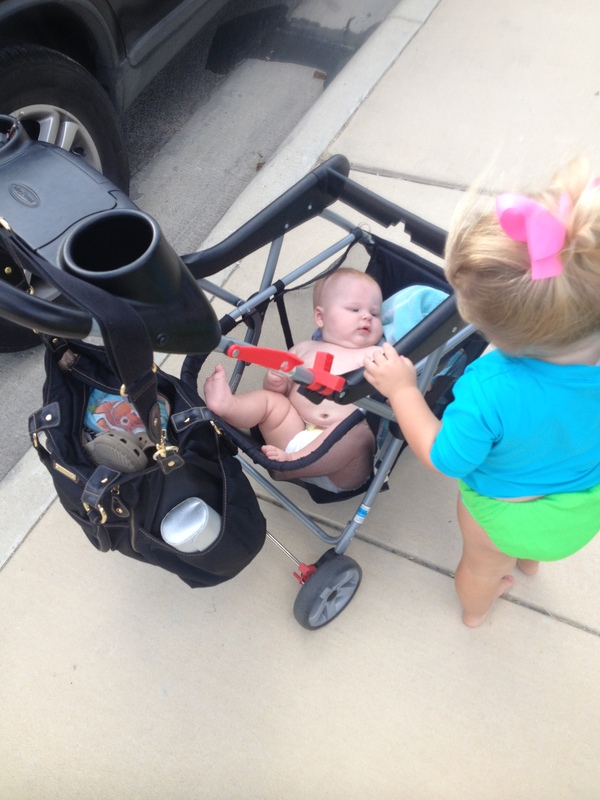 One day he even ended up in the basket part of his stroller (see pic). Another downside of excessive blowouts is the potential to run out of backup outfits. You see, multiple blowouts in one day equals a pink ensemble (translation: the only clothes Mommy has left is big sister’s pink kitty cat outfit; see pics below). His best skill though? SLEEPING THROUGH THE NIGHT. In the last month (knock on wood), Rex has finally perfected his sleep skills!! Hallelujah! He’s like a little alarm clock and wakes up every morning pretty much at 7:15am and since I get up hours before then, it feels like he sleeps in for me! Rex has some pretty cute attributes and habits. He always puts the soles of his feet together and it’s adorable. It’s like he’s praying with his feet. He also loves to study my face. He just stares deep into my eyes, smiling and watching me. He could totally beat me in a staring contest! His eyes are also very expressive – he truly does smile with his eyes. He has “kind” eyes. I think they will help him out in life (especially when it comes to getting girls, LOL!). Rex is super duper ticklish and giggles like crazy when tickled. I LOVE tickling him! It’s so awesome! He’s also starting to “talk” and chatters and babbles a lot. If he talks even half as much as Landri, we are going to be in trouble, LOL! For some reason, Rex is obsessed with the (out)sides of my car. He rolls up in his walker next to my car when we are playing outside and just rubs his little hands all over the sides of my car. Sadly, my car is dirty 99.99% of the time so his little hands turn black. It drives me CRAZY. I think it’s his version of finger-painting, haha! Rex has huge, delicious fat rolls all over his body! Rex really does love Landri and gets really happy when she pays attention to him. And here’s another super lame Scott Says interview. I may need to give him next month off to rest up and be able to bring it the month after! S: He can hold his bottle now. M: what is Rex’s favorite thing? M: Really? He doesn’t even sleep that much anymore except at night which is awesome. M: What is his best skill? S: He doesn’t have any skills. M: That’s not true, but okay. What is Rex’ s most unique feature? M: He has a fat head? M: I think you mean that he has a large head.